We’re running two Resource Lists workshops next week for academic staff and course administrators. By the end of the workshop, you’ll be able to use Talis Aspire to create your own resource lists. We’ll also explain how the Library is using Resource Lists to manage Course Collections and provide access to core reading materials for students. This entry was posted in Uncategorized and tagged Resource Lists, Resource Lists @ Edinburgh, Talis Aspire on September 28, 2016 by Sarah Ames. I know, I know, Semester One has barely started and already we’re asking you to send us your Semester Two reading lists. If you have a reading list that you would like the Library Learning Services team to convert into a beautifully formatted Resource List using Talis Aspire, then please send your list along with a completed Resource List Coversheet to IS.Helpline@ed.ac.uk by 12th October. The Resource List coversheet should be completed for each list submitted. The coversheet gives us all the information we need to prioritise and process you list, e-reserve scans and book recommendations. When we’ve created your list we’ll send you a summary of the items on your list, books, journals and articles, with information on how many copies are held and at what libraries. Clearly indicate on the reading list supplied which items you’d like scanned and we’ll pass on these to the e-reserve team. Also, provided you have prioritised your list using, Essential, Recommended and Further reading and tell us the expected number of students, we’ll make any book recommendations for additional, or new copies, based on the ratios in the table below. Alternatively, you can use Talis Aspire to create your Resource List(s) yourself. There is a range of user guides to help you get started. If you’re not already registered to use Resource Lists, contact IS.Helpline@ed.ac.uk to request access. If you publish the list by 9th November, prioritise the items on your list and use ‘Note for Library’ to provide details of any e-reserve requests, we’ll review your list, pass on your e-reserve requests, check for number of copies, and, based on the ratios in the table below, pass on any book recommendations for additional or new copies. There’s more information on the Resource Lists @ Edinburgh service on the IS website. This entry was posted in Library and tagged book recommnedations, course reading, e-reserve, reading lists, Resource Lists, Resource Lists @ Edinburgh, Talis Aspire on September 24, 2015 by alaurins. For session 2015/16 the Library is making it easier to request core teaching materials. We are Beta testing using Resource Lists @ Edinburgh (Talis Aspire) as a single contact point for processing e-reserve requests, course (print) reserve and book recommendations. Please note, if you don’t want to provide the extra information via resource lists, you can continue to publish your lists and make e-reserve requests and book recommendations in the usual way. The options described below are for Course Organisers who want to manage requests for e-reserve scans, course (print) reserve and book recommendations via their resource list(s). Option 1. Create the resource list yourself using Talis Aspire, include the additional information requested by the Library and publish your list by *7th August*. The Library will process any e-reserve requests, course (print) reserve and book recommendations. Option 2. Send your reading lists to the Library by *13th July*, provide the additional information requested and the Library will process any e-reserve requests, course (print) reserve and book recommendations and hand the list back to you to publish. Existing Talis Aspire users are asked to review and republish their lists by *7th August* and to use ‘Note for Library’ on Talis Aspire to provide the additional information required by the Library. The Library will process any new e-reserve requests, course (print) reserve and book recommendations. NB: Deadlines are for Semester One resource lists. We will circulate further deadlines for Semester two in due course. This entry was posted in Library, Uncategorized and tagged book recommendations, course reserve, e-reserve, reading lists, Resource Lists, Resource Lists @ Edinburgh, Talis Aspire on May 26, 2015 by alaurins. 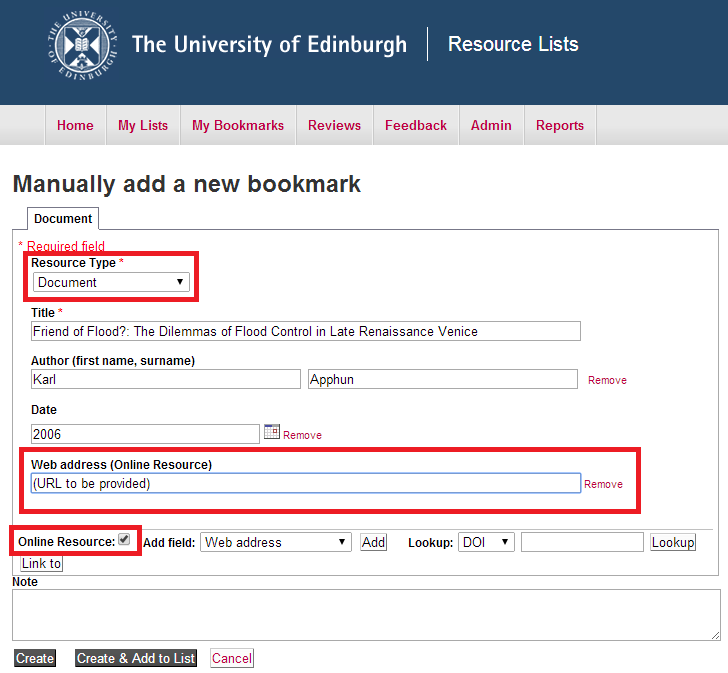 Resource Lists @ Edinburgh now have a series of short video tutorials! This entry was posted in Online library resources, Research & Learning Services and tagged Library Learning Services, Resource Lists @ Edinburgh, Talis Aspire, User guides, We can help on April 14, 2015 by Stephanie Farley - Library Learning Services. Talis Aspire have launched an updated bookmark tool that will work with both HTTP and HTTPS websites. In reaction to a number of security issues that occurred last year, many websites have slowly been changing from a HTTP address to a HTTPS address. Moving websites to a HTTPS address increases security by adding a ‘secure certificate’ to the site. However, the addition of this secure certificate has been clashing with the Talis Aspire bookmark tool and may have been preventing it from working on some of the sites that you regularly use. (The bookmark tool is the button that appears on your browser bookmarks bar which is used for adding resources to lists). When Talis Aspire detects that it is being used on a HTTPS website a pop-up window will let you know that a newer version of the bookmarklet is available and provide instructions on how to install it. Please install the newer version of the bookmark tool when prompted. The current bookmarklet will still work on HTTP websites; however, we would recommend you update the bookmarklet tool. Talis Aspire have made it even easier to do this. Adding or updating the bookmarklet tool is a quick process. Go to http://resourcelists.ed.ac.uk/ and then to the ‘My bookmarks’ tab. On the right of the page is an ‘install bookmark button’, click on this and Talis Aspire will detect which browser you’re using and walk you through adding the bookmark tool. This entry was posted in Online library resources, Research & Learning Services and tagged Resource Lists @ Edinburgh, Service Update, Talis Aspire on January 22, 2015 by Stephanie Farley - Library Learning Services. In June we ran two hands-on sessions introducing Resource Lists @ Edinburgh using Talis Aspire. After each session we asked for feedback, and you gave it! It is very important to us as we develop Resource Lists as a tool to hear back from you, so we really do appreciate all of your feedback. We have also taken the suggestion of a more advanced troubleshooting session under consideration, this would indeed be good to do once we have more people using the service. In the meantime we are also happy to arrange alternative training sessions for individuals or small groups. Missed out on the June sessions? That’s okay we’re running two more in July! The sessions focus on introducing Resource Lists @ Edinburgh using Talis Aspire, and all sessions are bookable via MyEd. Sessions begin with an Introduction to the Resource List system followed by a hands-on workshop where attendees are able to try out the system and start creating their own Resource Lists with the support and guidance of Library Staff. This entry was posted in Library, Online library resources, Research & Learning Services and tagged Resource Lists @ Edinburgh, Talis Aspire, training, User Feedback on June 26, 2014 by Stephanie Farley - Library Learning Services. b) logged into the environment. – Please note that some articles/chapters are provided for you on LEARN. Ensure that you are logged into LEARN before attempting to read the article. If you are not enrolled for this course on LEARN you will not be able to access the article. – Click on the blue ‘Online Resource’ button to go directly to the article. title of the book in red text. We also recommend adding the below text in the Student Note for any bookmarked resource that will be provided as an E-reserve item via a VLE. Please note this article/chapter has been provided for you on LEARN. 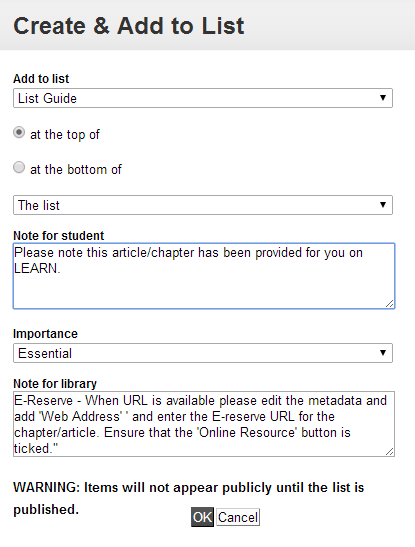 When creating a bookmark for an E-reserve article or book chapter please select the item type as ‘document’. This will ensure that Library Learning Staff can quickly and easily identify E-reserve items and also allows students to filter by item type if they want to focus on E-reserve articles. from and add this to your list. the following text, “Please note this article/chapter has been provided for you on LEARN.” (swap out LEARN for whichever platform being used by your School). 4. Once E-reserve provide you with the URL for your article/chapter, go back in and edit the metadata of your bookmark. 5. Click on the drop down box ‘Add field’, select ‘Web address’ and ‘Add’. 6. Cut and paste the E-reserve URL into the web address, then save (remembering to tick the ‘online resource’ box). The ‘Note for Student’ will be visible on the saved draft of your list and to students once the list has been published. However, the ‘Note for library’ will only be visible in ‘Edit’ mode and to the Library Learning Services team. Additional guides and information can be found on the Resource Lists using Talis Aspire webpage and the ResourceLists@Edinburgh Blog. This entry was posted in Library, Online library resources, Research & Learning Services and tagged Library Learning Services, Resource Lists @ Edinburgh, Talis Aspire on June 16, 2014 by Stephanie Farley - Library Learning Services.